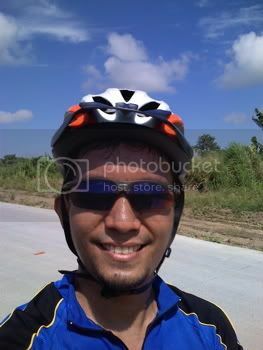 the day after my birthday, i dragged myself out of bed very early in the morning and pedaled to janice's house. 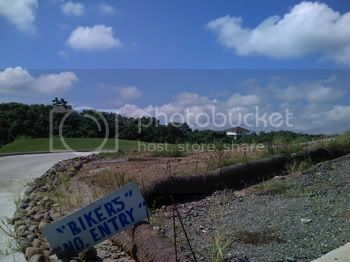 i had signed up for another ride in the interior roads between santa rosa, laguna and silang, cavite. 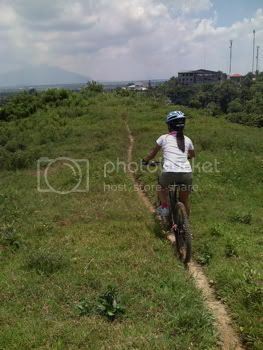 my misadventures in mountain biking have been recorded here with vivid detail (check this, and this, and this, and this, and this), so it isn't such a big secret that the last time i did this was a very long time ago, and all the training i've been getting is riding from my place to a few select spots in makati. nevertheless, i felt prepared. i took my bike for a tune-up at sabak the previous day, and i finally unwrapped my new bike shirt and gloves from the rudy project sale a couple of months ago. upon our arrival at sir manny's house in santa rosa, i was given a boost of confidence by the fact that there were several newbies in the group -- i at least will not be last, so that's a relief! i gave them much encouragement though, talking about my first forays into mountain biking, many of which were largely unplanned and unintentional. they at least were prepared for the day ahead. so we saddled up and took off for places i've never seen before. after around 15 minutes, we had to suffer this uphill climb that cut through a golf course. on the side was a very clear sign saying bikers weren't allowed. ha! discrimination! very early in the bike ride, and despite having grasped some basic things about shifting gears, i couldn't pedal anymore, and i had to dismount, and push my bike up for a few meters. and it was like 40 degrees celsius out there so i was burning! rather literally! after that, the rest of the ride was filled with "reasonable" challenges which i enjoyed. 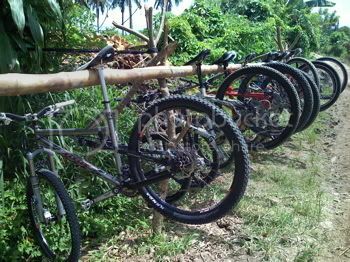 there was the stop at the bukohan, and although i wanted more, i only had a pathetic P30 with me during the ride. i surely did not expect it to be that interminably hot! and there are so many other bikers along the trails. i noticed that bikers are worse than fashionistas. they look at you from head to foot and scrutinize your gear, glance at your bike, and make conclusions based on how expensive the individual parts of your ride is. it's something which takes much away from the culture of riding bikes, and the real reason why i do it: i do enjoy biking, and i look forward to reaping the many benefits it brings to my health. 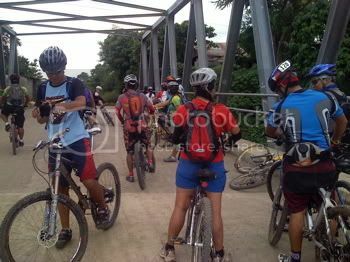 also, the trails, which passes through rural corners of laguna and cavite, are filled with kids who shout two of the less than 20 words they know in english: "good morning!" 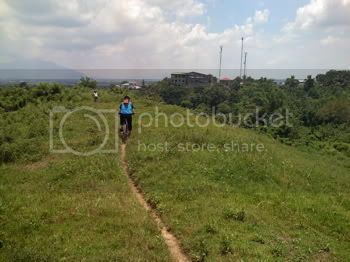 then sir manny took us into a corn plantation with unkept trails. haha. i got a few cuts from the blades that surrounded us. if grass were any sharper, i'd have been a salami. towards the end of the trail, there was debate whether we'd stop for lunch, or proceed to the PNPA where B2k8 was having their rappelling session. the latter won out, and had i known that the ride would have been just as it was, i would have just voted to go home. we rode the national highway, which was filled with cars, had a steady ascent, and had absolutely no trees that provided shade. it was awful, and it wasn't fun anymore. it felt like a chore rather than a great ride. i hated every part of it. 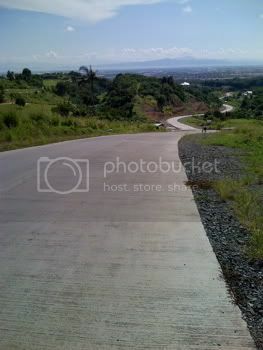 but the PNP academy campus is really nice: good landscaping over undulating terrain. the 2k8ers were having lunch when i arrived and they immediately drew the conclusion that i was the fastest and strongest because i arrived first. muscle cramps were actually already killing me by this time. one of the best parts of the ride was going home from the PNPA. it was over 10 minutes of absolutely no pedaling! biking should be all downhill, i swear! 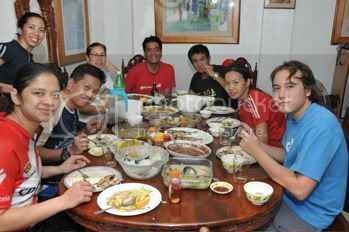 at sir manny's, the food had been prepared, and we were all so famished, even though i had some chicken at the PNPA courtesy of apple, that i gobbled plate after plate of tita didith's great cooking. and as has been tradition, we didn't go home immediately after taking individual baths. we nursed bottles of beer and sang karaoke! and jeng better not post that video of me singing and dancing to ricky martin's "she bangs" or else! haha. my tan lines are rather obvious, but i'm glad i got to go out again, get a good tan, and even better exercise! i am so getting fat!